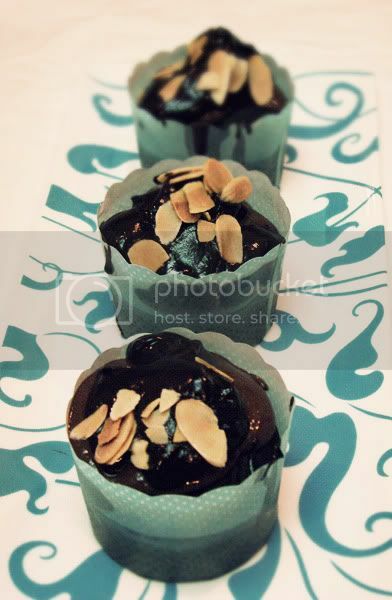 As usual, I was surfing around the wonderful world of food blogs and I came across Zoe Bakes who was doing Vegan Triple Chocolate Cupcakes..
1. 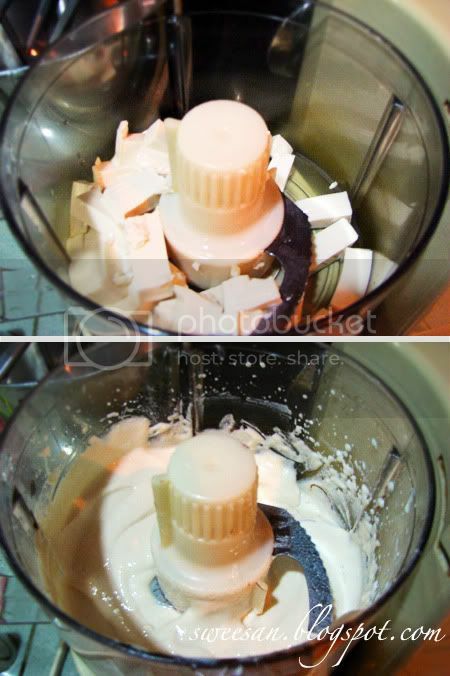 Drain tofu and blend in a food processor till smooth. Use a spatula to scrape all the time. 2. Melt chocolate, agave nectar ( I used honey instead) and instant coffee powder over a double boiler. Add chocolate mixture to the tofu and blend till everything is well incorporated. 3. You will also see that the mixture will start to thicken, like custard / pudding texture. 1. Pour soy milk in a pot and bring to a boil. 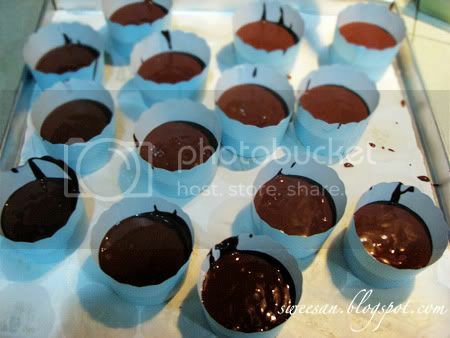 Add to chopped chocolate pieces and stir till all has melted. 1. 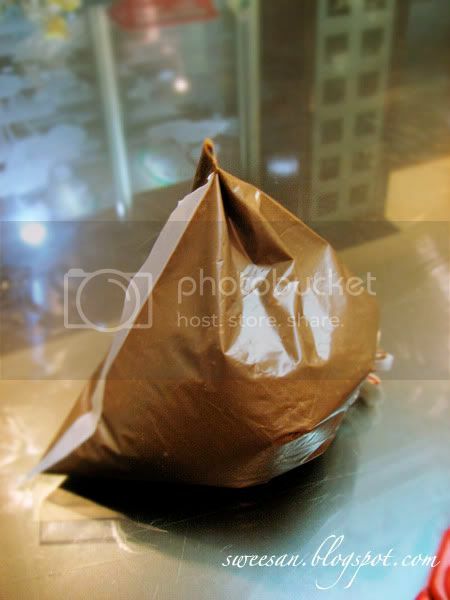 In a large bowl, combine flour, cocoa powder, baking powder, soda and salt. 2. Melt chocolate and oil in another bowl over a double boiler until smooth. 3. Whisk agave (I used honey) into the chocolate mixture. Stir well to blend. 4. In a mixing bowl, whisk together soy milk, vanilla, vinegar and liqueur. 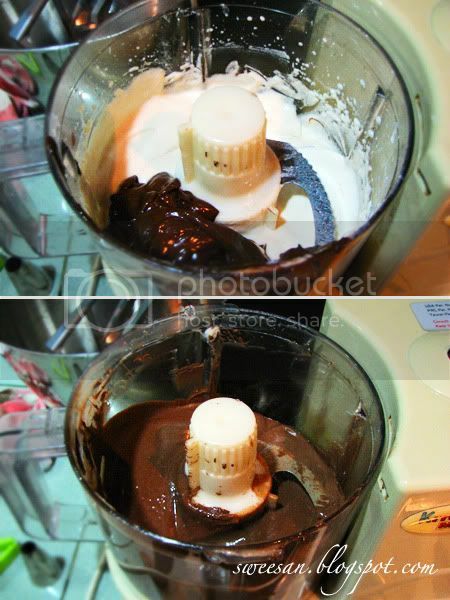 Stir into the chocolate mixture and gently whisk wet ingredients into the dry. 5. Divide batter into muffin cups and bake for about 20 mins at 170 C or until tester comes out clean. 1. Cut the top of cupcake. Think like an inverted cone shape. Make sure not to cut too deep otherwise the cupcake will be floppy. 2. 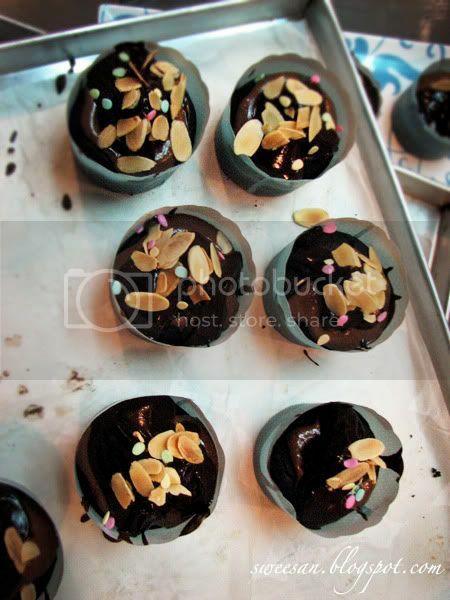 Fill in the center with mocha filling. Cover the top with the cut out cake, no wastage! 3. 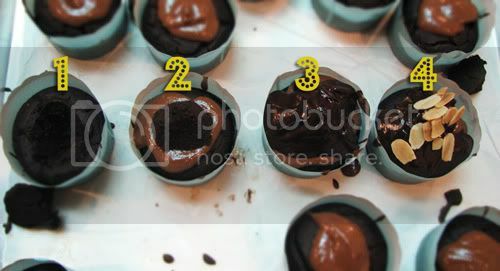 Add a spoonful of ganache on top of the cupcake. You can pipe or use an ice cream scoop and smooth out like Zoe. I was a little lazy, I just piled everything on top. I really liked the Mocha filling as the texture was just right creamy but not too pudding-like. And by just blending tofu instead of the usual egg-custard-method. Easy! As for the cake, well I didn’t use agave nectar. First of all, is it even sold here in Malaysia? Anyway I used honey instead so I wasn’t sure if the texture would be the same. There’s a giveaway of Robin Asbell’s New Vegetarian book in ZoeBake’s post but I think it’s closed now. No added sugar doesn't mean there isn't any sugar. lol!!! Lovely vegan cupcake! YUM! Haha yea I know ! !